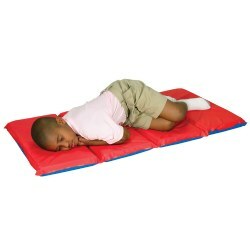 Keep infants and toddlers safe, comfortable, and cozy with our blankets, sheets, mats, and cots. 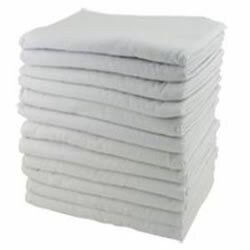 Kaplan's selection of products is easy to clean and stack, making pick up a breeze once naptime is over. Make nap time snug and storage time convenient. High-quality, washable vinyl cover. Folds for compact storage. 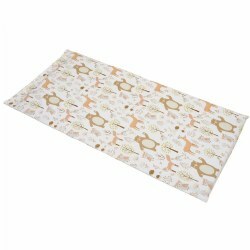 Measures 24"W x 48"L. Choose between 3-fold or 4-fold mats and thickness. 2 years & up. The perfect cozy napping friend for you little one. 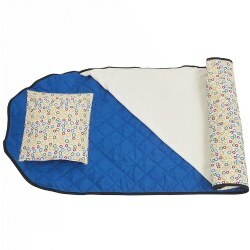 This quilted cot cover with attached, lightweight fleece blanket features a carrying handle and removable pillow. It's a great all-in-one solution for your child's sleepy time comfort needs. When it's not on a cot, the Nap Companion rolls up and can be easily secured with the built-in elastic bands. 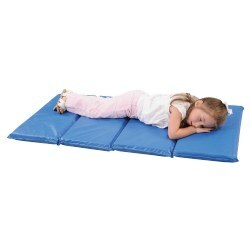 Size: 51.5W" x 22.5" x 0.5"D.
Rest Mat is covered in washable vinyl. 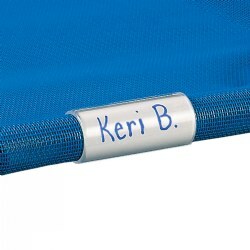 Mat includes a name holder. 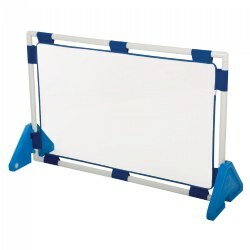 Measures 45"L x 23"W x 2" thick. 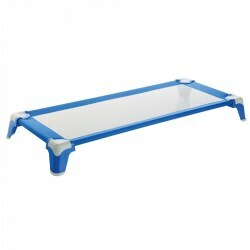 This easy to view acrylic Cot Name Card holder fits our cots (excluding SpaceLine® cots) . Sold in packs of 5 and includes a full set of name cards. 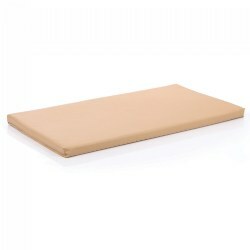 Washable covers keep mats sanitary and makes rest time cozy. Slips over 1" - 2" thick mats. The pillowcase mat sheet slips over the mat like a pillowcase and has one side printed, one side plain, it measures 53"L x 25"W. The fitted mat sheet has bulit-in end pockets to hold the sheet into place, it measures 24" x 48". 12 months & up. 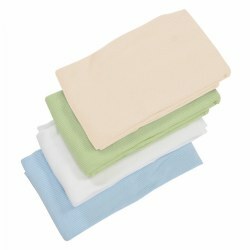 Germ Guard™ Rest Mats are durable, comfortable and completely hygienic! Mats are manufactured using radio frequency vinyl welding technology which completely seals all seams protecting the foam padding from liquid and bacteria contamination. 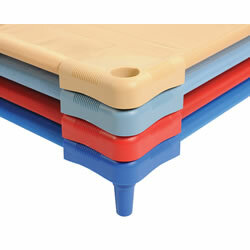 Mat can be used in a variety of spaces and folds easily for convenient storage. Available in three sizes. Bright, vivid colors make nap time more appealing! 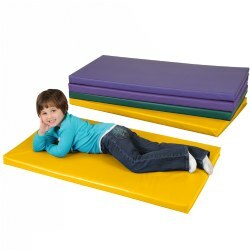 This mat is covered with tough, washable vinyl and filled with 2 inch foam. This mat meets California TB 117-2013 fire code specifications. Individual name card holders are attached to each mat for ease of identification. Mats measure 45"L x 23"W x 2" thick. Available in single mats and sets of 4. 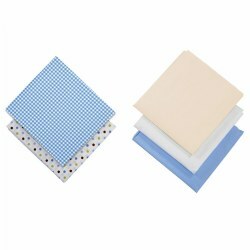 Cot sheets are 100% microfiber polyester and have an elastic band for a snug fit. Machine washable. 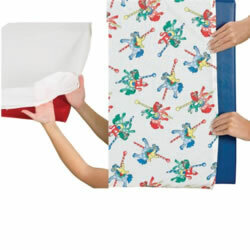 Toddler sheets measure 40"L x 22"W and standard sheets measure 52"L x 22"W. Choose color/style. This 100% cotton white blanket is 36" x 60". Machine wash, warm. Tumble dry. Soft and snuggly blanket provides a feeling of security while keeping child warm. Economy priced, machine washable, no shed, no pill fabric. 100% polyester. Available in blue only. 30" x 60". Buy individually or purchase as a set of 4. Cot carriers hold up to 12 cots. 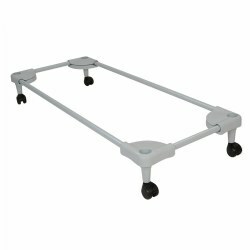 Wheels allow for easy maneuvering. Toddler cot carrier measures 40"L x 21"W x 7"H and the standard cot carrier measures 52"L x 21"W x 7"H. Gray color only. Invite children to rest comfortably during naptime with these pillowcase mat sheets. Choose between the plain white sheet or gentle forest friends to provide a warm and inviting surface for children to settle in and relax. White sheet is a poly/cotton blend and measures 24"W x 52"L. The Forest Friends are soft microfiber and measure 25"W x 51"L. Sheets fit over 1"-2" thick mats. Machine wash and dry. 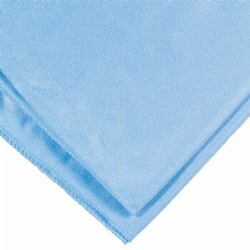 Breathable cotton thermal blankets are machine washable and measure 36' x 48". Available single or in a set of four. The assorted set of four includes one each of blue, ecru, green, and white. Choose color.